Peacefully located at the end of a country lane, on the edge of the picturesque and touristy village of Roussillon, with all facilities within a 2-minute drive (1.5km). This spacious and airy. Peacefully located at the end of a country lane, on the edge of the picturesque and touristy village of Roussillon, with all facilities within a 2-minute drive (1.5km). This spacious and airy, fully equippd holiday villa makes for easy living, with satellite TV with foreign channels and a private swimming pool. It offers stunning views over the Luberon mountains and hilltop villages including Bonnieux, 15km, Le Rustrel, 19km, and Roussillon. These last two are situated in an area known as the ‘Colorado of Provence' owing to the red and gold of the rock faces, from which ochre is mined to make pigment for artists' paints. In Ménerbes, 16km, once home to Picasso, even the houses are painted red and gold. The Luberon National Park is criss-crossed with many walking paths which are true havens for nature lovers and walking enthusiasts. Many towns and villages organise tours for hiking, biking, horse riding and climbing. This villa is made from brick or stone. The agent has rated it as a three star property so it is a well-kept villa, equipped with standard furniture. It is also good value for money. 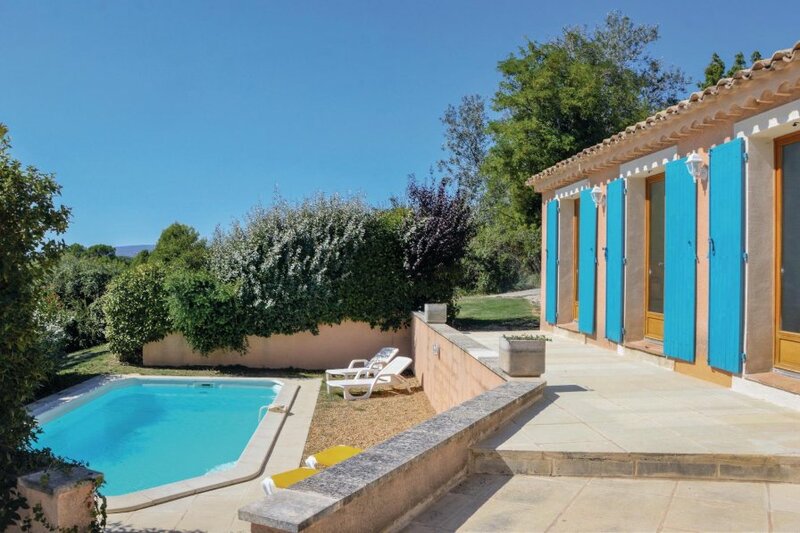 This villa has a swimming pool and mountain view; it is also located in Roussillon, only 9km from Gordes. It is set in a good location: there is a restaurant 1km away.